My mom was staying at the Embassy Suites, across the street from the Hyatt where her conference was held (the Music Library Association, in case you're wondering). We weren't sure where to park so we parked in the strip mall next door and called my mom. She walked out to meet us with a whole entourage of fans: Janet, Amanda, Doug, and Janice. It was fun to see everybody, even if it was only for a little while. We loaded up my mom's things, as well as Amanda's, and headed off to see some sites before leaving Atlanta. Naanii managed to squeeze in the back seat between Rachel and Miriam's car seats. They were happy to both get to sit beside her. Our first stop was the Center for Puppetry Arts museum. Andrew found it while looking for relatively inexpensive activities at relatively nearby locations. 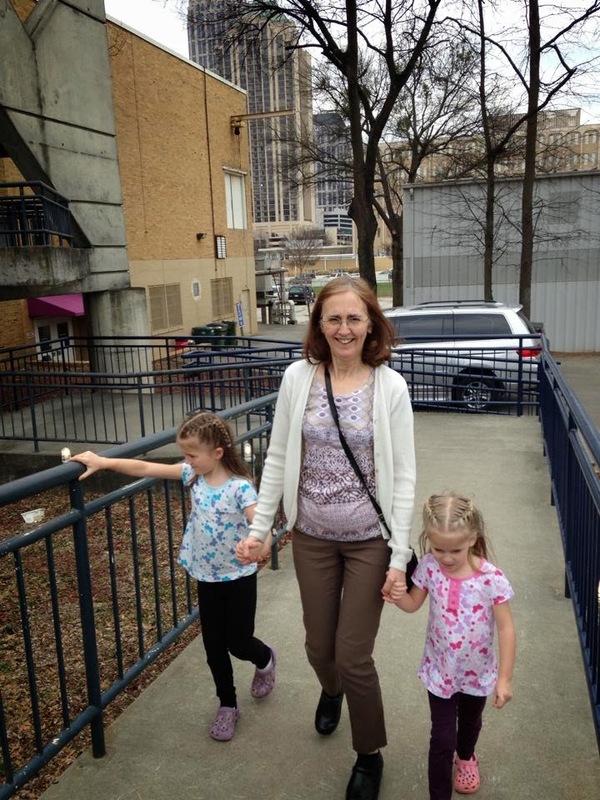 Atlanta boasts the largest indoor marine habitat in the world—the Atlanta Aquarium—but with a sticker price of over $100 for our family to visit it didn't feel worth it with our limited time. And...I also watched Blackfish recently and I'm not sure I could have stomached seeing all these marine animals so far from their natural environment so soon after watching that film. Anyway, the puppet museum only cost $30 for our family and the kids probably had as much fun (and experienced just as much fright) as they would have had at the aquarium. 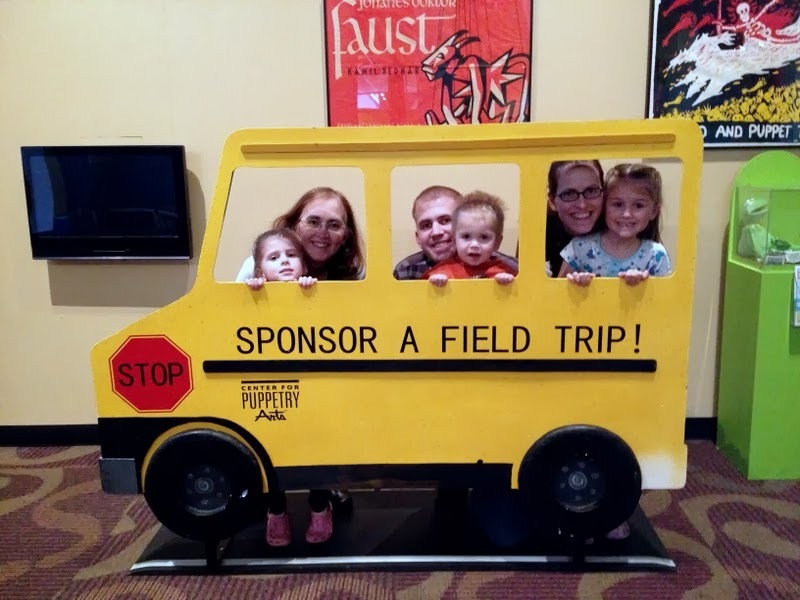 The first thing we saw when we walked in was this little school bus, which drew Benjamin like a magnet. 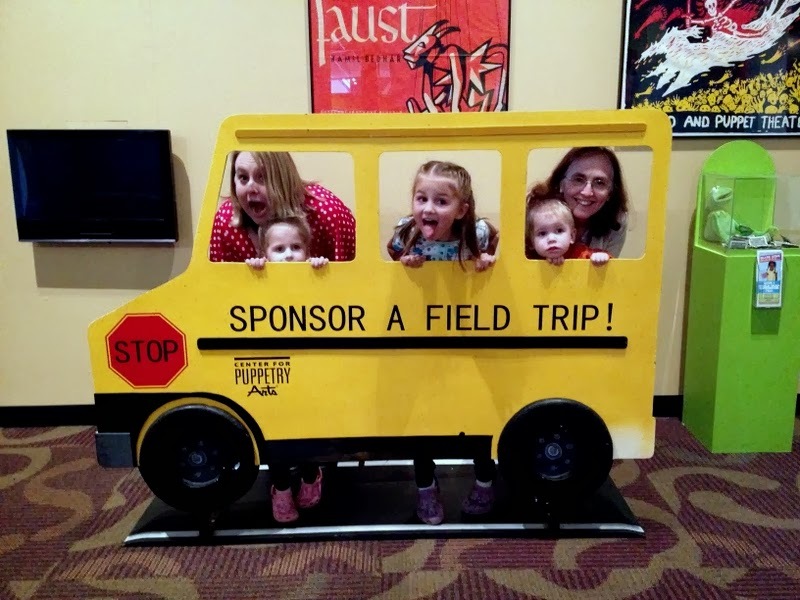 "Bus! Bus! Bus!" he chanted happily as he toddled towards it. It was easily his favourite feature of the entire museum. Amanda took a picture of our family with Naanii and then I took a picture of her in the school bus as well. They had some rather famous puppets—like Kermit the Frog and Miss Piggy. It was a relatively small room and we were rather unimpressed but apparently we'd missed the doors to the actual museum altogether and only found a small exhibit room. 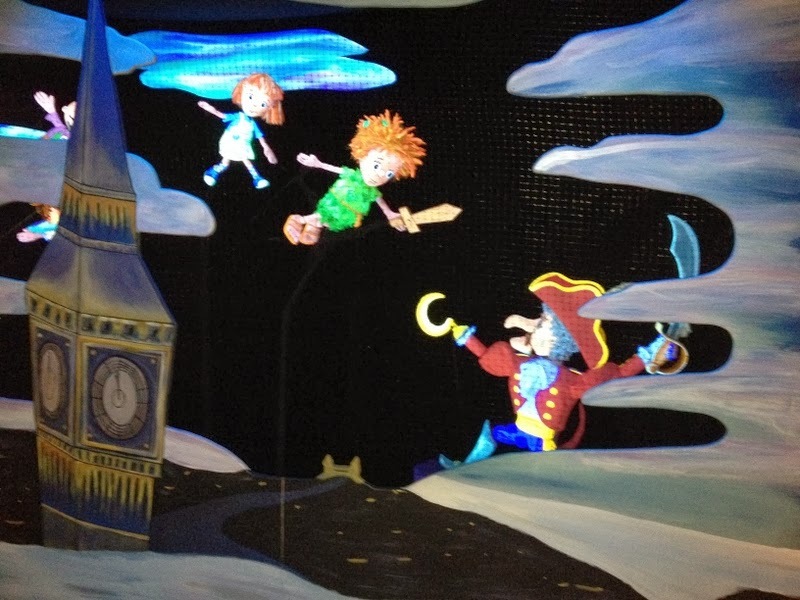 To get to the actual museum you have to brave walking under/around Pinocchio's legs. One leg had crashed through the ceiling and was resting on the floor. The other leg was suspended in midair, having just broken through the ceiling. Benjamin also found this part of the museum thrilling. "Shoe! Shoe! Shoe!" he cried. Unfortunately, the girls found the first couple of rooms absolutely terrifying. The first room held an animatronic puppet that morphed from an old oil bin into a phoenix—with much banging and clanging and puppeteered blasts of fire. We ran out of that room and into the "puppet storage" room where special machines were keeping the air the right humidity and temperature (scary noises!) and where some puppets were kept under the floor with plexiglass roofs (scary see-through floor!) and there were limp and lifeless puppets dangling every way you looked (the horror!). We had to speed through that room, too. Other rooms were less scary overall, though I think at least one child panicked in every exhibit we visited. There were all sorts of puppets: shadow puppets, marionettes, hand puppets, famous puppets, foreign puppets. 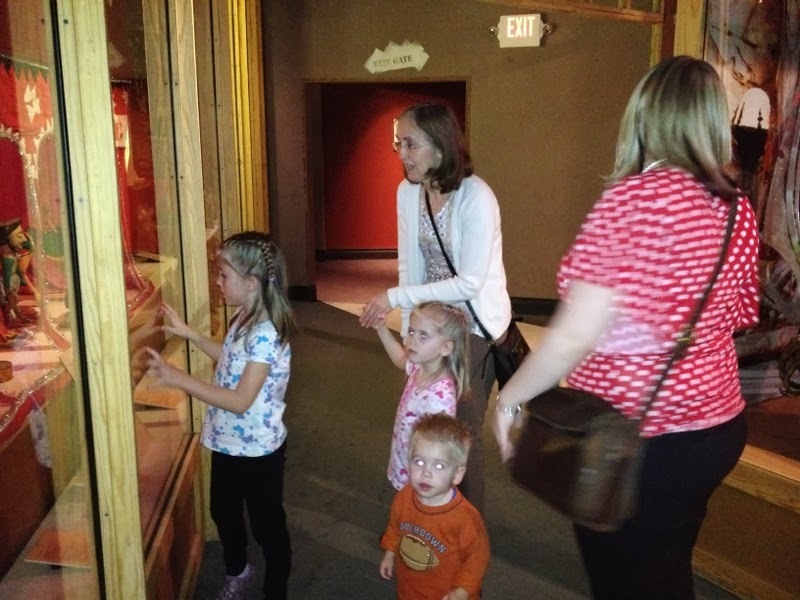 One room—perhaps the only one that didn't frighten any of the children—was a hands-on exhibit where we could do our own little shows. Rachel and Miriam again regaled us with their amazing puppetry. There was no flash permitted in the museum so the pictures are a little grainy/blurry. It didn't help that the girls' well-intentioned shows devolved into frenetic fight scenes within seconds of laying hand on the puppets. 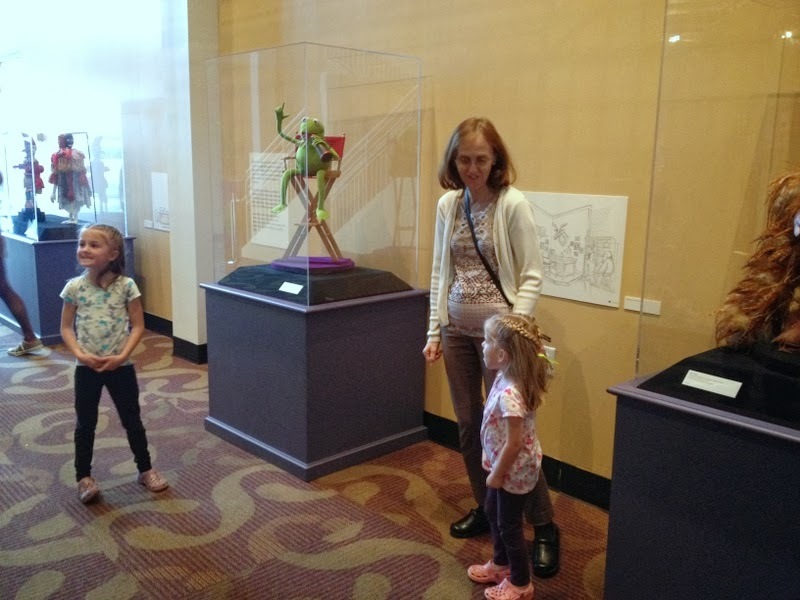 Everyone was excited when we got to the Muppet room. 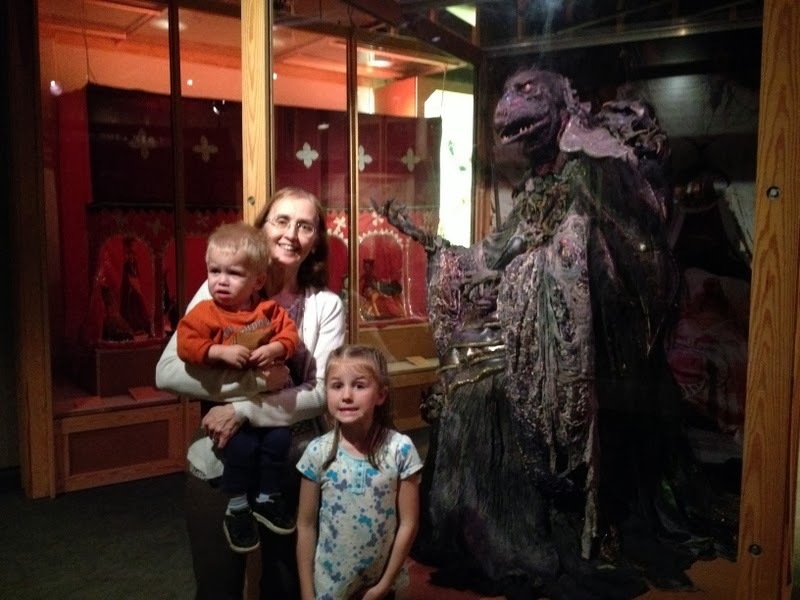 We found a Skeksis, which the kids weren't too sure about. Rachel agreed to stand beside it—quite nervously—for a picture, Benjamin was forced to be in the picture as well because Naanii was holding him, Miriam flat out refused to get near the puppet. We also found Fishface from Labyrinth and some Muppets from space. This was a display of Japanese puppets. Benjamin was very concerned about all the "bad" puppets. He's very good at identifying emotions in illustrations (and puppets as well) and creature looking remotely sour-faced is immediately classified as "Bad! Bad! Bad!" Amanda and I were reminiscing about a drama class I took in high school where we slaved all year long to put on a banraku-style performance of Shakespeare's A Midsummer Night's Dream. We hand crafted puppets, designed and sewed costumes, edited the script, blocked/staged it. We did everything ourselves. It could have gone so well—and I suppose it didn't go terribly—but it only turned out so-so. A few members of the cast simply didn't have their heart in it. They sat around doing nothing during class, refused to memorize their lines, complained that drama was lame and that they were only taking the class for an "easy" credit, and so forth. It was infuriating to those of us who worked so hard! What's ironic is that the worst offender is currently touring with a Broadway show, singing and dancing his way across the stage daily in a major role. An odd place for such an apathetic theater student to end up. I'll have to poke around to see if I can find a picture of our creations. Papier-mâché heads, which we attached to the skeleton of the puppet using pool noodles, I believe; sewn and stuffed limbs and torso with wire hanger and wood dowel "bones"; yarn hair, hand-curled in some cases; hand-painted faces. These were some serious puppets. It kind of broke my heart a little when they were all thrown out at the end of the school year. But whatever. Oh, that same year we went "on tour" to California and got to see The Lion King on Broadway. That's kind of what prompted my teacher to suggest the whole puppet thing in the first place. The Lion King puppets were much better than ours. 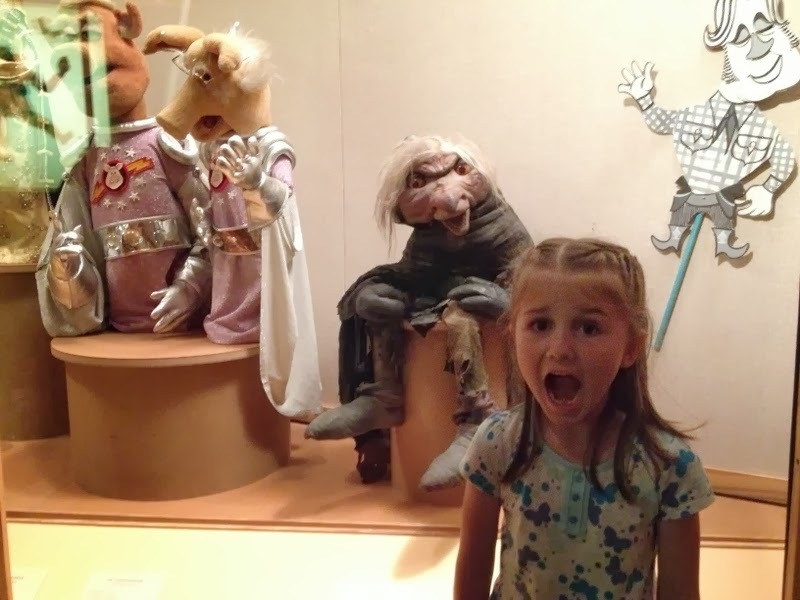 And, actually, a prototype of the Scar puppet was featured at this puppet museum! The puppet museum didn't entirely fill our afternoon so we decided to head to Centennial Olympic Park, hoping the Fountain of Rings would be running. It wasn't, but we found it and played around for a while, anyway. There were bricks with donors names all over the park. We found everyone's name, including my mom's kind of. Her name is Myrna, which is unusual, but we found a brick that included the place of the donor as well as the donor's name and the donor was from Smyrna (so we counted it). Behind this wall was a jump rope club. Rachel was interested in it because she's doing a Jump Rope for Heart campaign right now. They were pretty impressive with their double dutch skills. After we had our fill of the park we went to Waffle House for dinner. Mom got hash-browns "all the way" and I think everyone else got waffles (though Amanda got hash-browns as well, I think). After dinner we dropped Amanda off at the metro and bid farewell to Atlanta.